Every once in a while, I’ll hear or be told about some new amazing silent film discovery being shown at some festivals I don’t get to play at. It happens, I would imagine, with some of my colleagues, as well as with fans who don’t live near those festivals. I’ve learned to tell myself, “That’s okay, I will get to see or play for this somewhere at some point,” because that’s started happening. A few years ago I was visiting my friend Dino Everett, chief archivist of the USC Hugh M. Hefner Moving Image Archive. He told me about an extremely rare nitrate film from the 1890s he’d recently turned up, a version of the Edison May-Rice “Kiss” film that was performed instead by African-Americans. He held up the roll of film and unwound a little so I could see the images. I was sent a link to watch the film on Vimeo, as well as a piece of published sheet music composed called That Creole Gal of Mine composed by one of the performers in the film, Saint Suttle, as material to consider for scoring the 19-second film. Another accompanist had used or incorporated this tune into their playing. Most probably, this was shown without music in a viewing matchine in Kinetoscope parlor. At the same time, we’re all used to watching a silent film with musical accompaniment, and I’d been booked to play for this and a few other films, and I needed to come up with something that would work, that would support no only the film but the audience’s experience of the film and impression of it and of what they were seeing. Fortunately, the way the film was going to be presented was that it would be shown three times in a row, with a little blank film in between each iteration. Initially I was resistant to the syncopated cake-walk type music by Saint Suttle because I find ragtime to be too busy for film accompaniment in most cases. I’ve also noticed over the years I’ve been dong this and watching accompanied silents that ragtime gets played when an African-American character enters a scene. 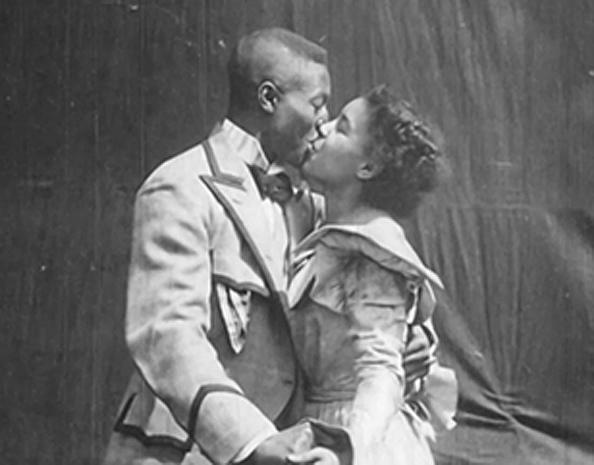 The audience was going to see this rare 1898 footage, in which the couple kisses each other four times over 19 seconds, for the first time ever at the show. I wanted the music to stay as far out of the way as possible. What’s performed in the very brief film is a very sweet, honest and charming moment. The couple is in stage costumes but are not made up in a stereotypical way and do not behave as though they are doing a vaudeville stage performance. Syncopated piano music was definitely going to get between the screen and the audience. And besides, the audience had absolutely no idea as to the significance of the specific piece of music I was playing. Telling the audience what I was playing and why would separate them from the moment onscreen even more. However, the footage was going to be shown three times. I decided to play something more gentle and romantic for the first and second times through the footage, to underscore the honest romance that we were seeing onscreen. It was, after all, one of the key points of interest in the footage, the first onscreen depiction of affection between an African-American couple. So I wanted to enhance or optimize that so the audience could see and experience it. For the film’s third time through, I used That Creole Gal of Mine, the song composed by Saint Suttle that I’d been sent. By that point in the presentation we’d all seen the film twice. The third time through accompanied by this tune, , to me anyway, came off a little more like a celebration. Was I right? I don’t know. Everyone who’s accompanied this little cinematic treasure has done something different I’d imagine, and all of it has probably worked just fine. I recorded my score during the show and will probably include this recording on the next episode of my Silent Film Music Podcast (available on several podcast platforms). I’m also embedding the film below, front he USC Hefner’s own posting on Vimeo, so you can see this amazing piece of historic early cinema that was added to the National Film Registry in 2018. Here’s the Irwin Rice Kiss film (1896) with John C. Irwin and May Rice, also 19 seconds long, sourced from the Library of Congress’ National Screening Room. The USC Hugh M. Hefner Moving Image Archive website is here. My podcast is on Apple Podcasts, Stitcher, Overcast, and Spotify. Here is a mini-doc I made about Dino Everett and the obscure 28mm movie movie format, from a presentation he gave on the subject at Mostly Lost, the annual film identification workshop held by the Library of Congress. ← Will the Real Reelcraft Main Title Please Stand Up?